JEDDAH: More than 40 percent of Saudi citizens are obese, according to a health official, as two major health campaigns were launched in the Kingdom around diabetes and high blood pressure. Diabetes and endocrinology consultant and chairman of the Saudi Society for Diabetes, Abdulrahman Al-Sheikh, said the campaigns reflected the principles of the Kingdom’s Vision 2030 reform plan which emphasizes the provision of preventive medicine and the fight against chronic diseases. He said there were 3.8 million diabetics in the Kingdom, representing almost 19 percent of the adult population, and that obesity was a major issue in Saudi society. Al-Sheik said that 45 percent of deaths were a result of heart diseases. Al-Sheikh said prices for hypertension and diabetes medication were high because manufacturers said their research was costly, but that the Saudi Food and Drug Authority (SFDA) got its pricing from more than 30 countries of any drug and discussed what was best for the local market. The two campaigns aim to alleviate the pain of patients as well as achieve a safe and high quality of life, according to the reform plan’s objectives for the health sector. 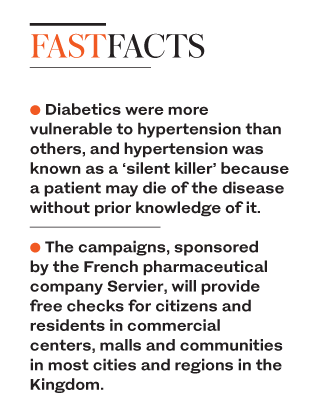 The campaigns, sponsored by the French pharmaceutical company Servier, will provide free checks for citizens and residents in commercial centers, malls and communities in most cities and regions in the Kingdom. The first campaign, which has been approved by the SFDA, is organized in cooperation with the Jeddah-based Friends of Diabetic Patients Charitable Association. The other campaign is organized in cooperation with the Saudi Hypertension Management Society (SHMS) and is currently in the final stages of the SFDA approval process. Senior consultant and head of the Pediatric Kidney Unit at Al-Qatif Central Hospital, Saleh Al-Shurafa, said the hypertension campaign went beyond the free screening process. Al-Shurafa, who is also president of SHMS, said that 70 percent of diabetics around the world had high blood pressure and that was the reason for linking the two campaigns. He said SHMS started in 2004 with health specialists from around the country. Their goal was to combine efforts in fighting the diseases and training physicians on how to diagnose and deal with hypertension.